There are over 500 species of the genus Viola, commonly called violets. They are found scattered across the world, but most are in the temperate areas of the northern hemisphere. Most violets are perennials, but a few are annual plants and a few reach the size of small shrubs. Pansies are violets; dogtooth violets (Erythronium dens-canis) and African violets (Saintpaulia) are not. Typically, violets are small plants growing about 12 inches high with a similar spread. They have heart-shaped leaves and asymmetrical flowers. The shape of the petals is a defining factor for many species. Blue and purple flowers are the most common. Red, pink, white, yellow, and bi-colored flowers also occur. Violas usually flower profusely during their bloom period. Traditionally they are a spring flower, but newer varieties have been bred to bloom all summer. Some species are hardy to zone 4. V. odorata and its descendents are the most frequently grown garden violets and the most beautifully scented ones. Parma violets are probably a sport of Sweet Violet. Pansies, V. × wittrockiana, are hybrids. At least three species were involved in their development: V. tricolor (Heartsease), V. altaica and V. lutea. Pansies are really biennials, but they are usually grown as annuals. Plants get about one foot tall. Flowers can be blue, orange, purple, red, white, yellow, or mixed. Traditionally, violets have been grown in partial shade and rich, moist soil. These are still the best conditions for them, although some species and some cultivars also thrive in full sun. Violets can be divided in the spring. If they are happy in their location, they will self-sow readily. Some species are a bit invasive. 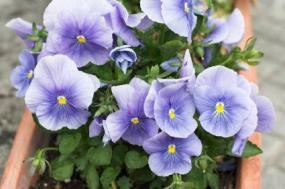 Pansies perform best in the cool weather of spring or fall. Flower production slows during hot weather, although deadheading can prolong the flowering period. In hot weather, pansies need some shade and a lot of moisture. Highly fertile soil or regular fertilization produces bigger flowers. Pansies can be propagated by seed or by cuttings. Violas are very easy to grow. They may be attacked by ordinary garden pests and fungi, but the problems are easy to control. 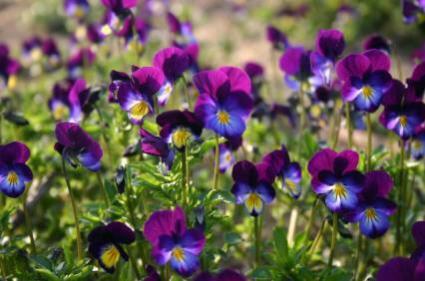 Violets and pansies are used as bedding plants, edging plants, and in containers. Violet flowers and leaves are edible, and are sometimes used in salads. Crystallized violet flowers are an edible decoration for cakes and pastries. Candied violets, called violettes de Toulouse, are still made commercially at Toulouse, France. Syrup made of violets has traditionally been used for respiratory ailments. Violet tea has been used for digestive disorders and as a headache remedy. Read Violet for the Victorian Gardener's opinion of these charming flowers.